Watch over 68 lectures & 10 hours of content! 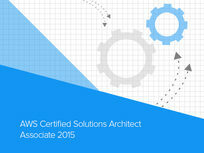 Ryan Kroonenburg is a London-based AWS Certified Solutions Architect and AWS Certified Developer with 17 years of IT experience and knowledge of both Windows and Linux. He teaches a number of courses on Udemy, and is passionate about helping both newbies and experienced professionals master cloud computing concepts. For more details on the course and instructor, click here. View over 58 lectures & 8 hours of content! Ryan Kroonenburg is a London-based AWS Certified Solutions Architect and AWS Certified Developer with 17 years of IT experience, and knowledge of both Windows and Linux. He teaches a number of courses on Udemy, and is passionate about helping both newbies and experienced professionals alike master cloud computing concepts. For more details on the course and instructor, click here. Gain a complete understanding w/ over 15 lectures & 3.5 hours of content! Eduonix specializes in technology training content in the form of video tutorials and other learning materials. It strives to teach students how to apply various technologies in the professional world, including but not limited to server administration and web to enterprise interfaces. Karan Brar is currently a Senior Linux and AWS architect experienced in designing AWS infrastructure, building environments, and other aspects of cloud computing. He brings to his course over 8 years of experience as a certified RedHat, Oracle Weblogic, and IBM Websphere Application Server professional. For more details on the course and instructor, click here.